Please fill in the short form below with your question, either about the Simrad RI35 Rudder Indicator, or for some technical advice. Please include details of your vessel if you feel they will help us answer your query. The Simrad RI35 is the perfect partner for use with the AP35 Simrad Autopilot Systems. 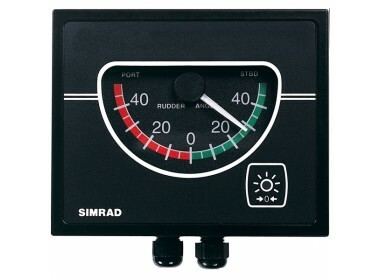 It is designed to operate from frequency or current signals generated by a Simrad autopilot feedback unit. It will also accept a NMEA 0183 rudder angle (RSA) signal. The splash proof non corrosive aluminium construction allows panel, bulkhead or bracket mounting in exposed locations, such as bridge wings as well as wheel house and engine room. 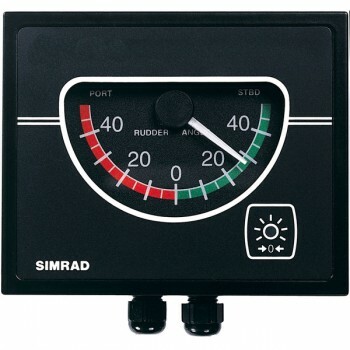 With the Simrad RI35 you have a continuous reading of the rudder position up to 45 degrees on either side of the midships position. With no signal input the pointer moves out of scale to port. A front panel key is used for illumination and setup adjustments. The instrument also has a separate PCB is mounted inside the instrument to convert the input signals and drive the indicator.